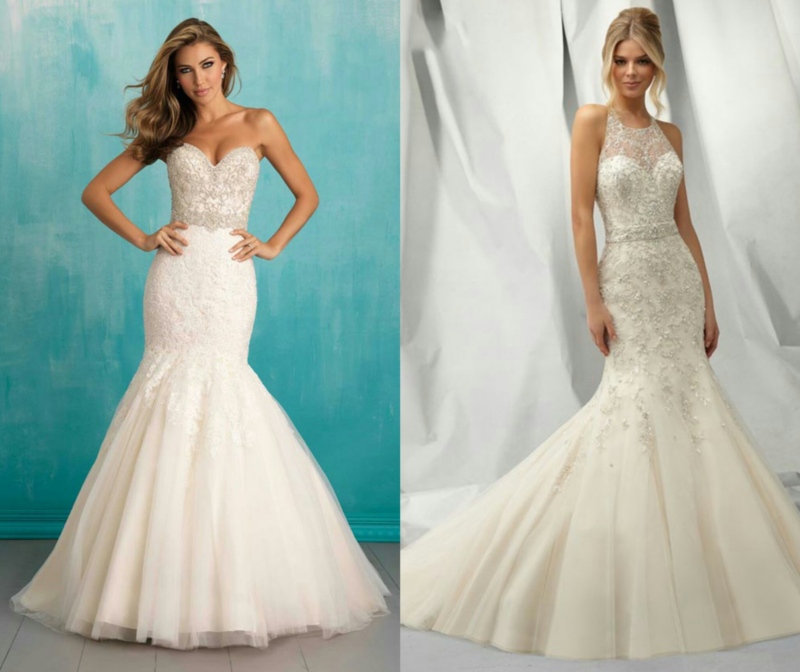 Over the past decades we have come across many different trends, especially when it comes to bridal gowns. Year after year we have been able to witness many different looks and materials that have taken center stage when it comes to bridal attire. Although the framing ideas of bridal gowns has remained the same, there are some things that have evolved. Here are a few of our favorite looks and how they have evolved into today. Modesty was fundamental in the 1990s bridal gowns were very modest with high necklines and long sleeves, occasionally layered with gloves. Veiled hats and long trains were very prevalent in this time period. 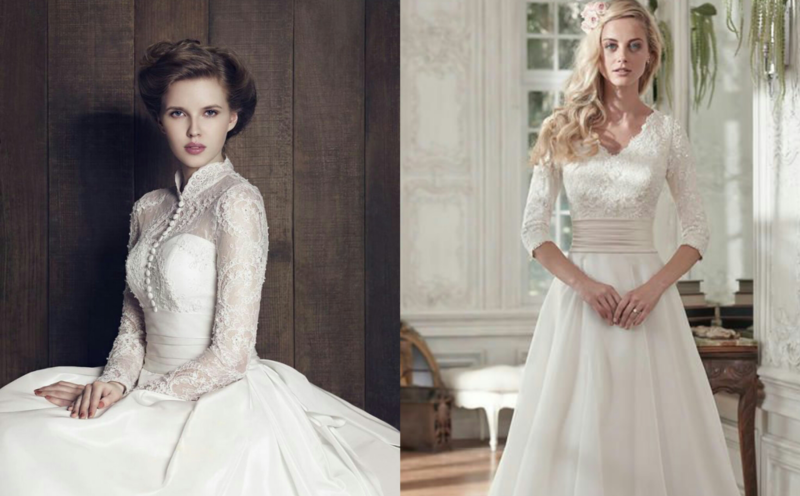 On the left side we have the classic 1990s look with a beautiful but modest neckline, while on the right we have the evolved version of the dress. With a deeper V and risen sleeves, this bride bares a bit more skin; however, the dress and appearance are still kept very modest. The 1920s was a complete change for bridal gowns. Modesty was no longer in. Shortening the hem and plunging the neckline, fun dresses were all the rave in the 1920s. Pieces of the 10s endured, still seeing covered arms, but long dresses were no longer the look for bridal gowns. 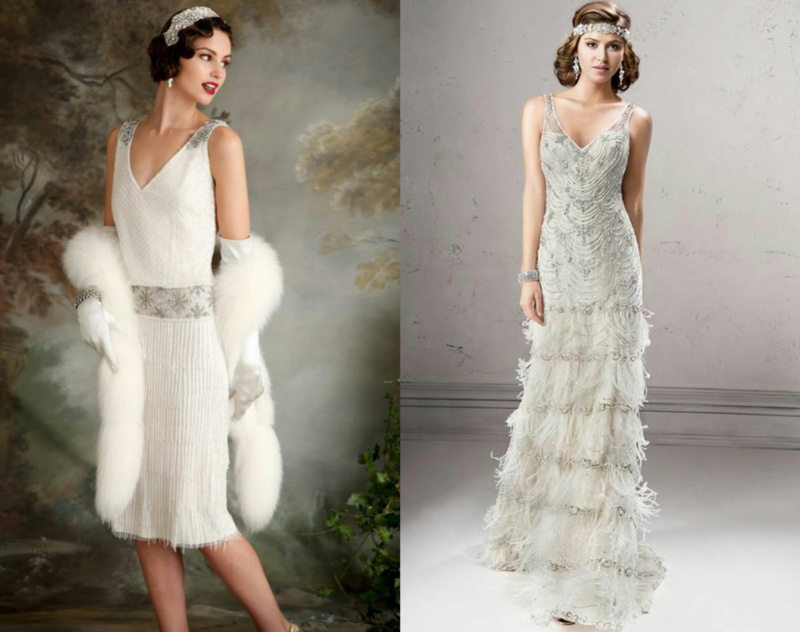 One the left we have the classic 1920s look: short and flirty with decadent accessories and embellishments. On the right we have the evolved version, which showcases the essence of the Great Gatsby in all of its deserved glory. The 1950s is a classic era. We can thank Elizabeth Taylor for this, who made the sweetheart neckline the must-have; it was likewise the era of lace. 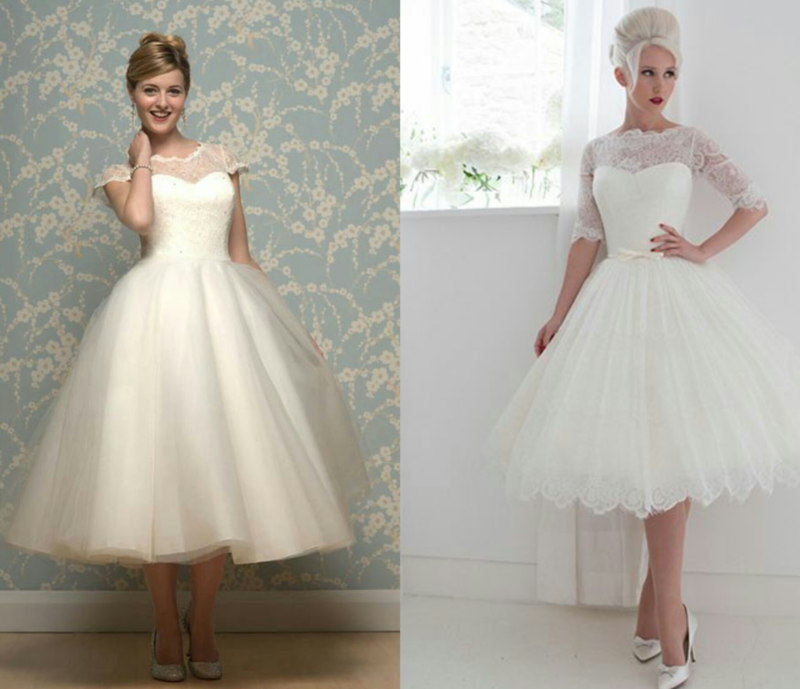 Look at the dress on the left, and you have the classic 1950s lace-sweetheart combination, with the newly-introduced, tea length dress. On the right you have the evolved version with multiple layers of lace, an eye-catching hem, and delicate pops of red lips and nails to kick it into our decade. The 1960s was the year of the flower print. Floral and metallic detailing became very popular among bridal gowns, as did empire lined silhouettes. And, while gown length returned, veil length began to retract upward, skimming the lower back and even shoulders. 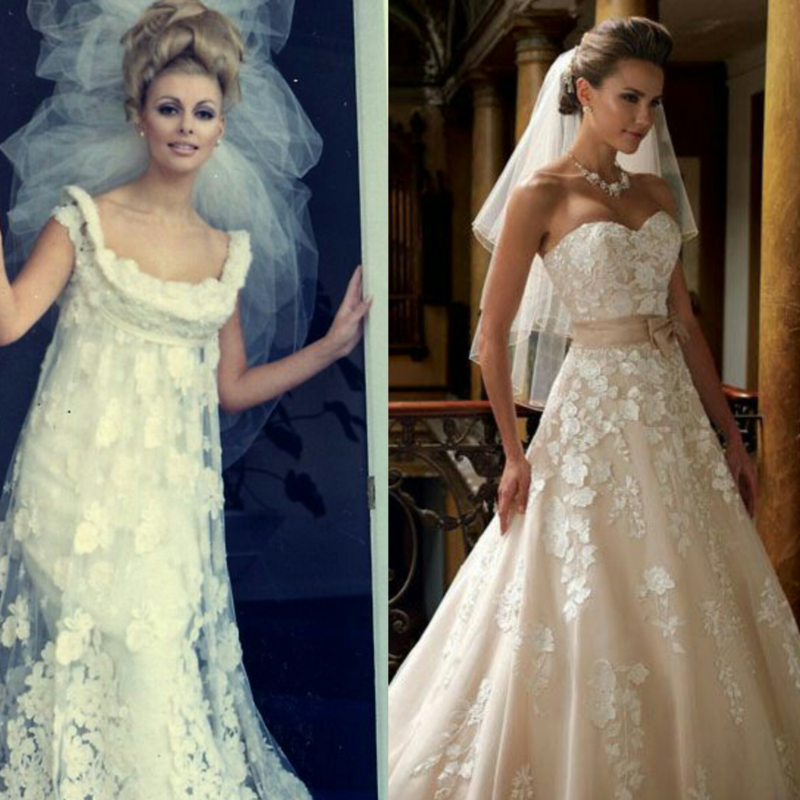 On the left you have the perfect 1960s gown with an empire waist and floral design and shortened veil. On the right you have today’s recreation, which showcases a building floral design brushing the top of a champagne colored gown with a sweetheart neckline and the shortened veil. The 1980s was the decade of BIG and BOLD, and “The bigger, the better.” Bridal gowns doubled in size. Big puffy dresses, with cathedral trains and full veils strutted through this decade proudly. Inserting color into your gown also became a big trend. Choice colors included beige, ivory, champagne and magnolia pink. On the left you have the classic 1980s dress with the iconic cathedral train and well-endowed shoulder decor. 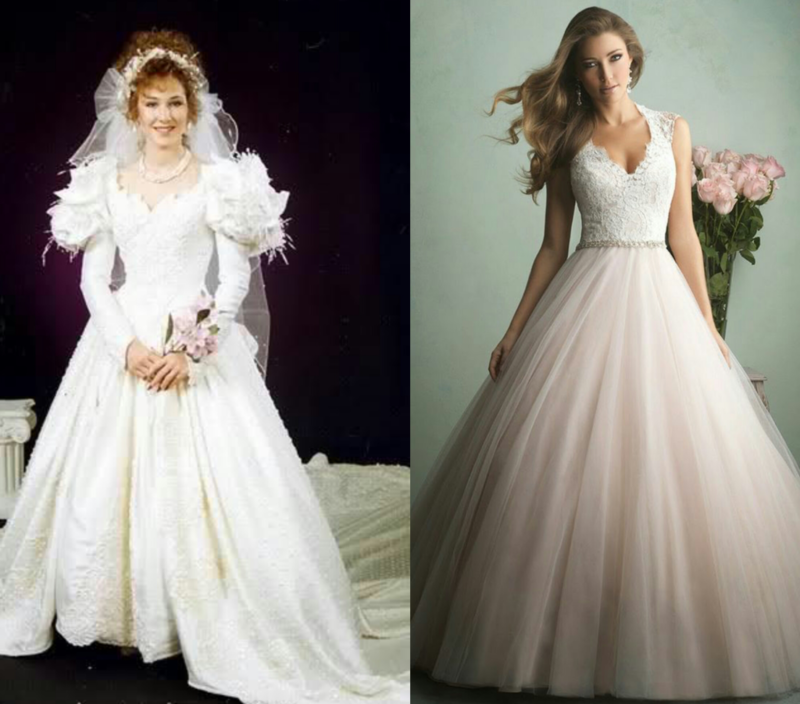 On the right you have the evolved version; while sleeveless, the encrusted jewels and princess ball gown skirt definitely descent from 1980. The 1990s was the decade of the simple and minimal bridal look. Although the hair was big, the gown was simple. Lace and beads fell from bridal fashion as the silhouette became the star. Flower crowns replaced overdone veils, and natural-hued makeup played upon the bride’s usual features. 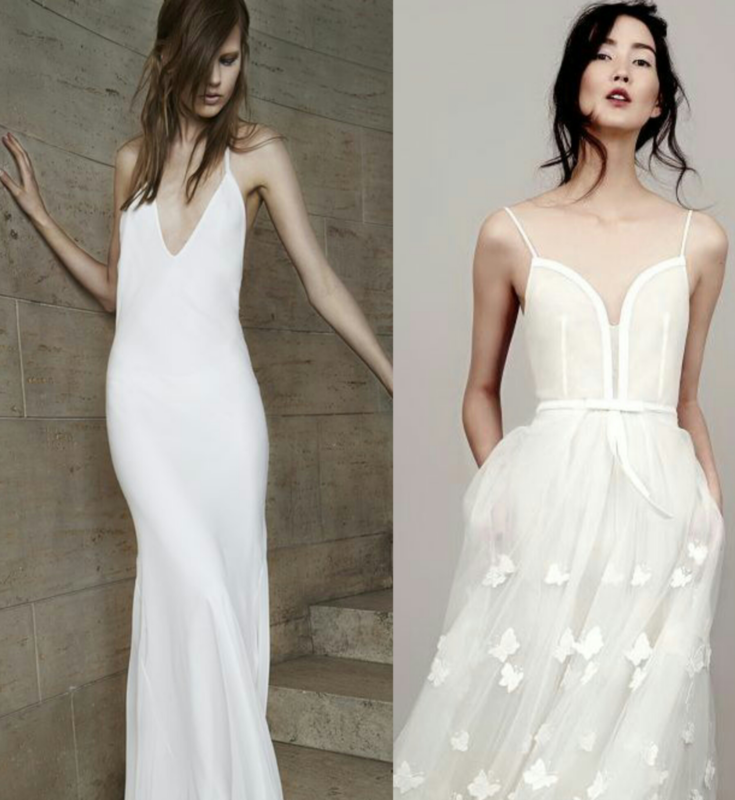 Simple, yet tailored to the bride, we at Weddinc love the simplicity the 1990s brought to us. The focus draws toward the bride rather than the gown by baring unadorned skin. While our version of this dress has added detailing, it acts as personality for the bride to own, rather than being overtaken by all the bells and whistles, or should I say tulle and sparkles. There may be now year of the fish according to the Chinese calendar, but 2010 proves this to be wrong. This decade is bridal gowns that curve and hug, making the fishtail gown one of the most popular bridal gowns of this era, but this is about all brides of this era have in common. This time marks one of the most versatile. Creeping out of the church and into destination weddings, experimenting with brighter, bolder color schemes, and implementing various cultural traditions, this decade is one of personality! Over the decades, we have seen many different changes in fashion and bridal gowns. Share the stories of your own bridal gown in our comments section. We love getting to know our readers past the likes!